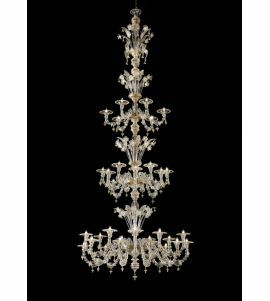 This section of our online store is dedicated to special multi-tiered glass chandeliers with inserts and precious decorations, various lamps and complex plots of glass or crystal drops, rings, pendants, Swarovski crystals and delicate details with a color content that gives them special qualities of clarity and majesty. Multi-staged or multi-tiered chandeliers are glamorous, eye-catching center-pieces best suited for luxury hotel lobbies, theatres or concert halls as well as other cultural institutions. All these products can be customized on request based customer needs so if you have an idea, we are here to make your dreams come true no matter how extravagant they are. 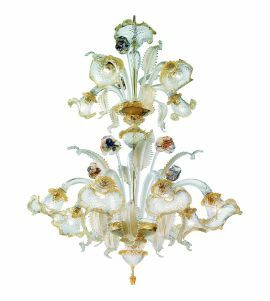 The Venetian Glass Chandeliers displayed in our store are certified and are lovingly crafted by our artists in the workshops of Murano.